Notes: This was easy and relaxing, but also mindful--you do have to pay attention so that you don't mess up the pattern. Also, to make the end of the scarf look like the beginning, you should purl 2 rows before binding off, rather than knitting 2 rows the way the instructions say. I was able to get a 7" x 78" scarf with the yardage I had. I chose not to add any tassels, so the finishing was very easy: only 4 ends to weave in! The yarn is discontinued, which is too bad, because it was good to work with. It has a slightly felted feel and has interesting nubs of different colors (blue. yellow, even orange) throughout. 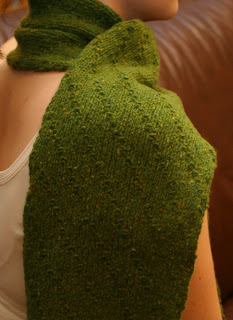 The yarn is light, as the scarf is meant as a present for someone in a not-very-cold climate.